Lake of the Woods and Shoal Lake are Number One in Ontario! 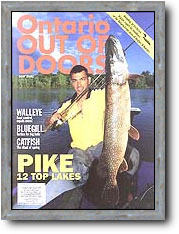 "Imagine a trophy pike lake�measuring 90 miles long and 55 miles wide with 65,000 miles of shoreline and 14,582 islands. Sounds Like heaven? It is! Not only does this area produce some of the best pike fishing in the world, but also has world class smallmouth fishing. Every year it produces trophy smallmouth and largemouth bass 5lbs. And up. Northern Pike in excess of 40", some 50"+ Muskie, 30+ inch Walleyes, and even trophy lake trout. Go on your own or let a professional guide take you to all the spots for each specie of fish that you like to catch.